Dentures: Do You Need Them? If So, What Kind? If you lose one or more of your natural teeth to gum disease or accidental injury, affordable quality dentures can replace them in both form and function. Dentures are lifelike artificial teeth designed to look and perform just like your natural teeth. Today’s advanced dentures are more comfortable and realistic than ever. 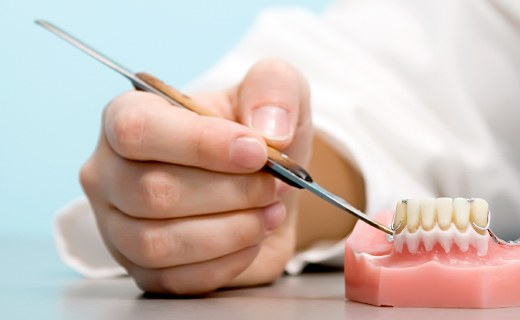 Your options for tooth replacement include both partial and full dentures. A partial denture attaches to a metal framework that connects to natural teeth still in your mouth. A full denture is a removable device that is placed in your mouth when all upper or lower natural teeth are missing. How Can I Tell if I Need Dentures? If you have lost your teeth, you’re a potential candidate for dentures. While there are several restoration methods available, it’s important to consider your individual circumstances, your budget, and other factors that affect your choice. If you’re not sure whether dentures are the right choice for you, talk it over with your dentist. Partial Dentures: Partial dentures are designed for people who have lost fewer than 50 percent of their natural teeth. If you’ve lost a few teeth, wearing a partial denture can protect your remaining natural teeth. Complete Dentures: Complete or full dentures are the best option when you’ve lost all your teeth, or they all need to be extracted due to severe disease. Tooth loss occurs naturally with advancing age, but complete dentures allow you to eat and smile with confidence throughout your golden years. If you’re nervous about getting dentures, you’re not alone. Talking with your dentist or friends and family members who already have dentures can help put your mind at rest and prepare you for all the great benefits dentures offer.